“What’s next?” is a question J.D. Scholten often hears when he’s at the grocery store. For most failed House candidates like Scholten, the answer doesn’t include running for Senate. But the Iowan is not your average losing candidate. He is among a handful of former House Democratic hopefuls weighing runs for higher office after raising millions of dollars last cycle and capturing national attention. At least four others are considering running for Senate in 2020 (not to mention failed Senate candidate Beto O’Rourke, who’s contemplating a White House bid). Senate Minority Leader Charles E. Schumer is trying to recruit Kentucky’s Amy McGrath to run against Majority Leader Mitch McConnell. Georgia Democrat Jon Ossoff says he will back Stacey Abrams for Senate, but isn’t “ruling anything out if she decides against” challenging Republican incumbent David Perdue. Democrats MJ Hegar and Joseph Kopser are considering bids against Sen. John Cornyn in Texas. Scholten is in “wait-and-see mode” when it comes to challenging Iowa GOP Sen. Joni Ernst. All of these Democrats proved they could raise the money necessary to compete in high-profile races last cycle and narrow the partisan performance gap in their districts. But they all also lost, which begs the question: Would their potential statewide bids be any different? The most obvious draw of these House contenders is their fundraising ability. 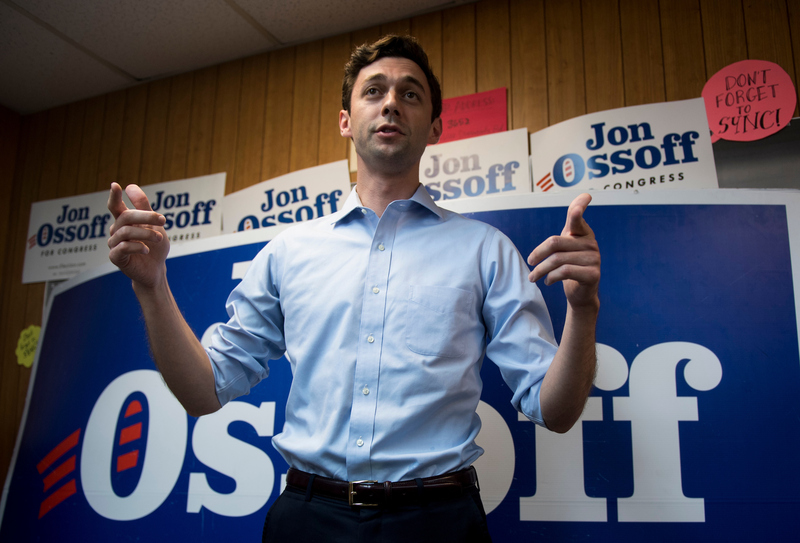 Ossoff raised nearly $30 million for the 2017 special election in Georgia’s 6th District, which Democrats around the country viewed as an early referendum on Donald Trump’s presidency. Ossoff’s email fundraising list, which he used to solicit cash for down-ballot candidates in the midterms, would be a boon for a Senate run. So would his name recognition. Speaking at a December town hall meeting in rural Georgia, far from the 6th District, Ossoff drew a crowd of 100 people. McGrath would also benefit from a lasting high profile and donor base. The retired Marine fighter pilot burst on to the national scene in 2017 with a viral web video introducing her candidacy in Kentucky’s 6th District. She won the Democratic primary by beating the early favorite, Lexington Mayor Jim Gray, whom national Democrats had recruited to run against her. By the end of the general election campaign, she’d raised about $8.6 million. She fell 3 points short of unseating GOP Rep. Andy Barr in a district that backed Trump by 15 points. Barr had won his 2016 race by 22 points. Now the national Democratic Party appears very interested in McGrath, whose team told Politico she hasn’t made a decision about running. Hegar raised more than $5.1 million for her 31st District race last cycle against GOP Rep. John Carter, losing by only 3 points. Two years earlier, Carter had won by 22 points, while Trump carried the seat by 13. Scholten was also a fundraising powerhouse, especially for a longtime Republican seat in Iowa. Up against Rep. Steve King, who made headlines for controversial comments about race and immigration, he raised more than $3.3 million. Trump won the 4th District by 27 points, but Scholeten only lost by 3. Kopser garnered the least national attention, absent a viral video or a GOP opponent with a national profile. The Democratic Congressional Campaign Committee added him to its Red to Blue program for strong contenders less than two months before the election. But the Army veteran and entrepreneur still raised more than $3.2 million in Texas’ 21st District. Kopser lost the open-seat race to Republican Chip Roy by just under 3 points, though Trump had carried the seat by 10. Kopser is weighing bids for the Senate or again for the House, but wouldn’t challenge Hegar, O’Rourke or former state Sen. Wendy Davis if they ran for Senate. While these Democrats all ran close races, they all still lost in a good year for their party. Ossoff and McGrath ended 2018 with the most cash on hand. But Scholten, Hegar and Kopser each had less than $100,000 in the bank, which pales in comparison to the GOP senators they may challenge. Even if Republicans are taking these potential candidacies seriously — McConnell’s team has been conducting opposition research on McGrath, for example — GOP operatives find their losses last year reassuring. Barr attacked McGrath last year with audio from a fundraiser in which she called herself “more progressive” and “further left” than anyone in Kentucky. If that line of attack was effective in a district Trump carried by 15 points, it could be more potent in a Senate run in a state that backed him by 30 points. Ossoff got in trouble in 2017 for not actually living in Georgia’s 6th District, something that would be irrelevant in a statewide race. But other attacks from the special election could follow him. Republicans turned Ossoff’s record fundraising into a hit against him, pointing to his out-of-state cash as a sign he was too liberal for the district. They also tried to paint him as an inexperienced youngster who had inflated his résumé. The GOP playbooks against Scholten and Hegar may not be as thick since the Republican incumbents largely ignored them last cycle. Carter did not name Hegar in an ad until late October when he launched a TV spot labeling her “as liberal as Austin is weird,” according to the Austin-American Statesman. Kopser blamed his loss on the increased attention on illegal immigration in the final stretch of the midterms, which he believed brought out GOP voters his campaign was expecting to stay home. Both Scholten and Kopser dismissed the GOP argument that a losing House candidate can’t win statewide. Scholten noted that King’s district is the most Republican of Iowa’s four House seats.